What's happening to Freeview on the 3rd September 2014? * Requires a Freeview HD box, TV or YouView receiver. ** Not available in all areas at the present time. Requires a Freeview HD box, TV or YouView receiver. *** Available to viewers with Freeview HD or YouView equipment who are in the coverage area of Al Jazeera HD on channel 108. ^ Previously on air in Manchester only on Freeview channel 76. It returned back to being Manchester only on 23/10/2014, but on channel 127 having been replaced by Tiny POP on channel 126. ...and will continue to receive Quest+1, Kiss, Kiss Fresh, Kisstory, Kerrang and Magic, which changed frequencies on 1st September. Are YouView users also affected? Yes. These new channel numbers and new channel additions also apply to YouView users. I receive the reduced Freeview service from a relay. Am I affected? Yes. This time, even viewers who don't receive the full range of commercial channels on Freeview are affected. CBBC, CBeebies, BBC News, BBC Parliament and BBC Red Button's new channel numbers as shown above will apply. Viewers can retune anytime after mid-afternoon on the 3rd September 2014, when all the technical work behind the scenes has finished. It should be safe to retune from 4pm. Digital UK, the organisation overseeing the changes on Freeview, has a retune guide on its website, with links to instruction manuals. If you are in an area where signals overlap, and you suddenly receive another region's news programme, see Digital UK's manual tuning guide, which will help you retune and store Freeview channels from the right transmitter for your area. Viewers who don't retune and don't have a TV or box that automatically retunes are being advised by the BBC, Digital UK and Freeview that they will continue to able to watch the main channels as before. BBC Distribution's Neil Walker says that holding slides will appear for one month redirecting viewers to the new news and children's channel numbers. Freeview says: "this change is in preparation for new services over the coming weeks and you won’t be able to access the new services until you retune." Viewers in parts of Gloucestershire and Herefordshire, South Lake District, Chesterfield and Sheffield may be affected by engineering work that may require some viewers to retune to continue receiving some BBC channels, including BBC One. If you haven't retuned Freeview for a while, channels such as TruTV (channel 68), CBS Reality (channels 66) and Movies4Men (channel 48) may appear in your channel line-up for the first time if you retune. These channels have appeared on the Freeview guide within the last six months (although Movies4Men was available in Manchester only before then). Further channels are launching soon. Viewers in Belfast, Bristol, Cardiff, Leeds, Liverpool, Newcastle and around the Solent have an extra incentive to retune: in these areas local TV is launching during September and October. Tests are already running, but retuning Freeview on the 3rd September for the other channel changes should also see you gain access to these new channels on channel 8 (channel 23 in Cardiff) if you are in the coverage area of one of these new channels. You can find out if you're in a local TV coverage area by visiting the official Local TV coverage checker. Your aerial will need to be pointing at a transmitter that carries the local TV service. (updated 17/09/2014) Chart Show TV has changed its carriage on Freeview. Previously available in local TV coverage areas, the channel is now 24/7 in Manchester only via channel 67. This change was not communicated in advance, and for several days around early September, the channel was not being distributed on Freeview at all. No channels are being taken off air. If you find you have lost channels, it's an indication that there's a problem with your receiving equipment or if you live in Gloucestershire and Herefordshire, South Lake District, Chesterfield and Sheffield, you may be affected by engineering work on the 3rd September that may require a retune to continue receiving BBC channels. Other reasons for loss of channels or poor reception after retuning: You might be in an area where signals from two or more TV transmitters overlap. Sometimes, especially older Freeview boxes store the wrong version first - sometimes leading to the wrong regional news being received or resulting in a poor, blocky picture. You can often tell if that's the case by going to channel 800, 801 etc and seeing if you have better quality duplicates of the affected channels there. If you are in an area where signals overlap you can also see Digital UK's manual tuning guide. If you have recently started suffering with channel loss on Freeview, it could be due to the activation of new 4G mobile masts in your area. You may have received a postcard from an organisation called at800, if your neighbourhood has been identified as being at risk from such interference. at800 works on behalf of the mobile phone network operators. It has a Diagnostics tool to help identify if any new interference to your Freeview signal is down to 4G. If you use a PVR to record Freeview programmes, you may need to update your favourites list following a retune as some channels will be on new numbers. This varies from device to device, and you may wish to check the documentation that came with your device. 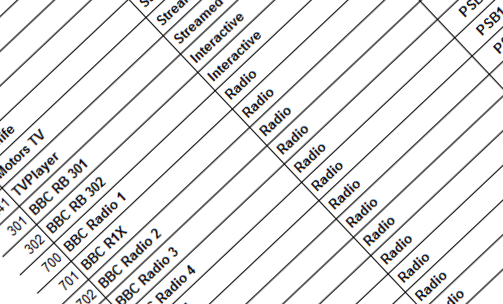 The BBC says that "some digital recorders may require scheduled recordings to be reset following a retune", so if you haven't done a retune before and you don't know how your PVR will handle it - make sure you note what you've got scheduled before you retune. Newer Freeview+HD PVRs tend to be smarter. Minicom service (deaf/hard of hearing): 0330 332 0975. Within the UK, 0345 numbers are charged at the same rate as national/local numbers starting 01, 02 and are included within inclusive minutes allowances on standard landlines and mobiles. By the way, what new channels are launching on Freeview? New channels are added all the time, but we don't always learn about new channel launches until they appear on the channel list. CBS Action (channel 90) is a case in point... Incidentally, ITVBe - a new "female orientated" channel, with a focus on scripted reality shows launches in October on Freeview, on channel 26. Further details will be provided by ITV before the launch. On the 28th August, a placeholder for TruTV+1 appeared on channel 69 filling the general entertainment section. And from mid-November, multiplex operator Arqiva has capacity available to new channels wanting to broadcast terrestrially. Why do children's channels have to move? There are enough empty channel numbers to fill below channel 70! There are some empty channel numbers for some viewers, such as channel 8, 23 and 50 to name a few. But channel 8 and 23 are used for local TV services in some parts of the UK and other channel numbers are used to broadcast additional services on Freeview in Northern Ireland and Manchester. Channel 64 is used to transmit a service with around 70% UK coverage and then only for viewers with Freeview HD or YouView devices. None of these apparently empty numbers are available for new UK wide channels. Why do we need to keep retuning Freeview? New channels can obtain licences from Ofcom and apply for bandwidth to broadcast on Freeview at any time. Sometimes channels are allowed to shuffle up to fill channel numbers vacated by services that have closed down. Unlike some recent retunes over the past few years, frequencies are not changing, so viewers won't lose channels as a result of these changes (if they do, there are other factors at play, see "will I lose channels? ", above). Most of the major changes taking place on 3rd September 2014 were originally scheduled to take place two years ago, but postponed following an appeal by Sky who at that time objected to Sky News moving to a new number. Now that the main channel section is almost full, there is a clear reason to move children's channels out of the way. The news channels are also moving to create a buffer between the children's and adult channels on the Freeview channel list and also to avoid another, separate retune event moving the news channels at a later date. I have Freeview HD. Will BBC News HD and Al Jazeera English HD move to the new news section? Freeview receivers could in the future substitute standard definition channels with high definition services, but more work is required before this function is added - your current Freeview HD TV would get confused if both an HD and SD channel were allocated the same channel number. Last updated: 23/10/2014. This page will no longer be updated, so some of the details above may be superseded by other developments.